This is a bimetal unresponsive professional yo-yo. This is the upgraded version from 9S Okkar with stainless steel rims. Powerful and for serious play. 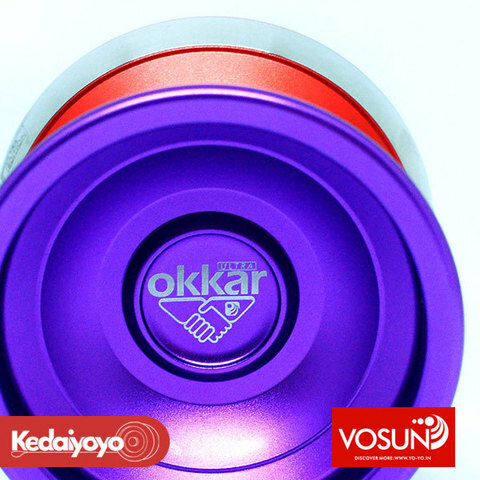 This is bi-metal version of loved Okkar, new weight distribution with ultra powerful spin. The hub design remain the same with monometal 9S Okkar. If you are looking for a yo-yo that spins fast, this Okkar Ultra will be the right choice! Vosun have built on the design of the previous yoyos by adjusting the weight slightly for improved play, and alsoadding a cup around the hub for improved finger and horizontal play! Apart from playing well, the Okkar looks fantastic! Available in a range of splashed/acid colours - you are gonna get noticed playing with this thing!